My Creative Existence: I'm skywatching again! It's been a while since I've done a Skywatch post, but when I saw this jet stream in the sky the other day I knew it would be a good excuse to join in the fun again! I've seen a couple of them in that exact spot lately - must have been the perfect conditions for jet streams on those days! LOL! See more skies from around the world here. Happy Skywatch Friday! Very unique photo Sarah, I love it. Very cool! Have a good weekend. I hope you're not getting wet down there! 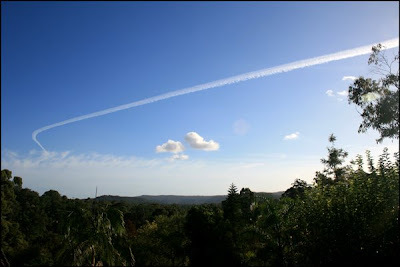 Stunning jet stream in the bluest blue sky! Greetings from the Mornington Peninsula, Victoria! Very nice vapour trail and nice sky in general. Happy SWF! Inkurable Stampers - April 09 Challenge!